SAN DIEGO — Perhaps I’m a romantic – or traditionalist – but I’ve always loved paper maps and charts. I learned to read maps by age 4 or 5, since my late mother had no sense of direction. Once I discovered nautical charts they totally captivated me with the detailed information they provide for both waterways and shore. To me charts epitomize the adventure and mysteries of the sea. With the arrival of navigational electronics – including chart plotters, GPSes, radars, AIS and smartphone navigation apps – paper charts are on their way out, some might think. Yet most responsible mariners and professional skippers, including operators of commercial ships, fishing vessels and superyachts, always carry up-to-date paper charts. But – why? Aren’t electronic charts better, more up-to-date? Actually, no, according to Capt. 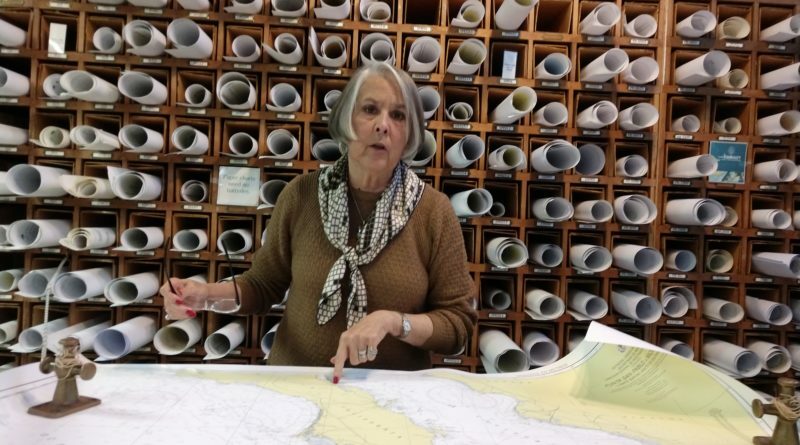 Ann Kinner, owner of Seabreeze Nautical Books and Charts, one of the last surviving nautical chart shops in the country. She explained that charts for U.S. waters on most chart plotters are based on older, non-copyrighted U.S. Government-produced charts that haven’t been updated and may not synch with GPS readings, as recently updated government-produced paper charts do. For safe navigation, with electronic charts you need a large, high-resolution display and, unless you zoom in properly, you don’t get the detail needed to show obstructions, such as hidden underwater rocks, she explained. A smartphone screen typically provides too limited a view of the navigational area for safety. Too many mariners, especially newbie boaters, don’t understand how electronic charting systems work or how to use the information they offer, Kinner said. Electronics can also fail in the hostile saltwater environment – think corroded connectors and frayed wires – and a smartphone can easily slip overboard, leaving you without navigation resources, if you’re relying solely on their displays. Because of recent reports of GPS interference or signal jamming in unsettled parts of the world, causing GPS disruptions or inaccurate readings, it’s important to have a backup navigation system. Nothing compares with the broad perspective and expansive view paper charts, spread out on a chart table or wide counter next to the wheel, can provide. On a paper chart you can see not only where you are but also the course you’ve plotted to your destination. “Electronic charts are a convenient tool. They don’t replace paper charts because you can’t see the larger context and they increase the risk of tunnel vision. Screens are hypnotic,” Kinner observed. “Look out the windows occasionally,” to see what surrounds you. For SoCal boaters Kinner recommends investing in a book of charts covering the region. For the price of a few individual charts, she explained, you can get charts from the San Francisco Bay area south to northern Baja. Similar chart books, updated about every four or five years, are available for other regions, including the Pacific Northwest. Most NOAA-generated U.S. single charts are now print-on-demand, with the latest corrections, such as relocated buoys and new construction or obstacles, incorporated at time of printing. Mexico, Canada and the United Kingdom also produce excellent, current charts. Seabreeze carries a wide selection of the most commonly requested charts and chart books, with less common charts available by order within a week. For heavily trafficked areas with considerable new on-shore construction, such as L.A./Long Beach or San Diego, Kinner recommends updating charts every year or two; for remote or stable harbors with little construction activity, every few years is adequate. If you’re in San Diego, stop by Seabreeze, located at 1254 Scott Street near Shelter Island, to discover the latest in charts, cruising guides and nautical books, or explore online at seabreezenauticalbooks.com.